I've just bought my PO-32 and I've downloaded Microtonic. I found the folder Sonic Charge in my Applicationsn folder with Microtinic inside. When i'm going to execute the program it appears "Could not open VST bundle". I don't know how to proceed. That's not good. Sounds like the installation broke. The VST is copied into the Application bundle as the last step of the installer. If it stops early this might happen. Could you please try to install again. Did you install the full bundle or only the Microtonic? I've installed first only the Microtonic and after the full bundle, and it stops early the installation as you said. I found where the plugins are installed and all seems to be correctly placed, but the message still appears. What happens during installation? Does it crash? Do you abort it manually? I know sometimes, on some computers, the last script takes ages to run. Still haven't figured out why. But usually if you just leave it on for a few minutes, it should finish. Yes, it says that the installation couldn't finish correctly (don't say why). After this, I'm able to find Microtonic "app" and all the folders with the presets, but when I execute it appears "could not open VST bundle"
I am not able to replicate this. Not sure why this is happening to you. Could you please restart your computer and then re-run the installation. This time, when starting the installer, go directly to the Window menu and choose "Installer Log". Now continue with the installation and once it is done (or encountered an error) click "Save" in the Installer Log window. 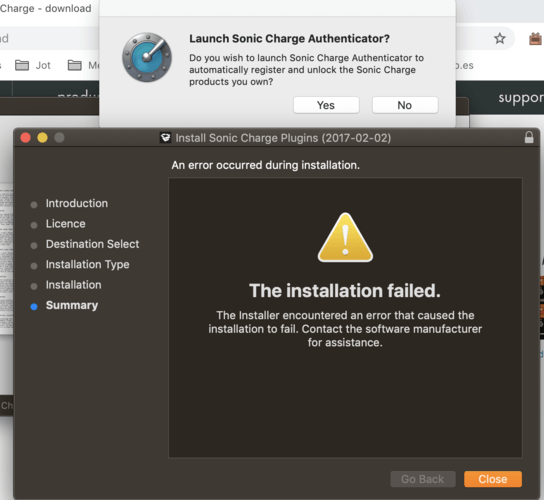 Send the log file to support@soniccharge.com and I will take a look at it. Actually, come to think of it, there are three folders that are expected to be in the Library folder.